The perfect gift for mother's day, this little Belly Bear is ready to let Mom know just how much she is appreciated. 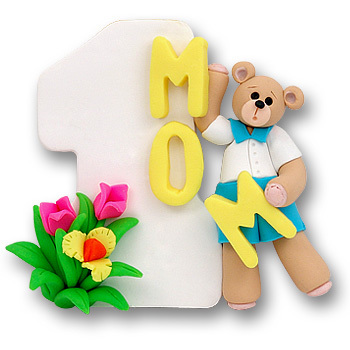 This Mother's Day ornament is also a great gift for Mom any time of the year. Let Mom know you care! Handmade from polymer clay and designed by Debi Allison. Comes complete with a hook and satin ribbon for hanging. May be personalized on the number one.